Blacksmith Coffee Roasters is being forged by two friends whose passion for rock climbing brought them together in a chance meeting at Mesa Rim Climbing & Fitness Center in Mira Mesa years ago. Raul Macias is a Structural Steel and Welding Inspector by day and Matt Delarosa left his day job in December of 2013 to focus full time on their roastery start-up. 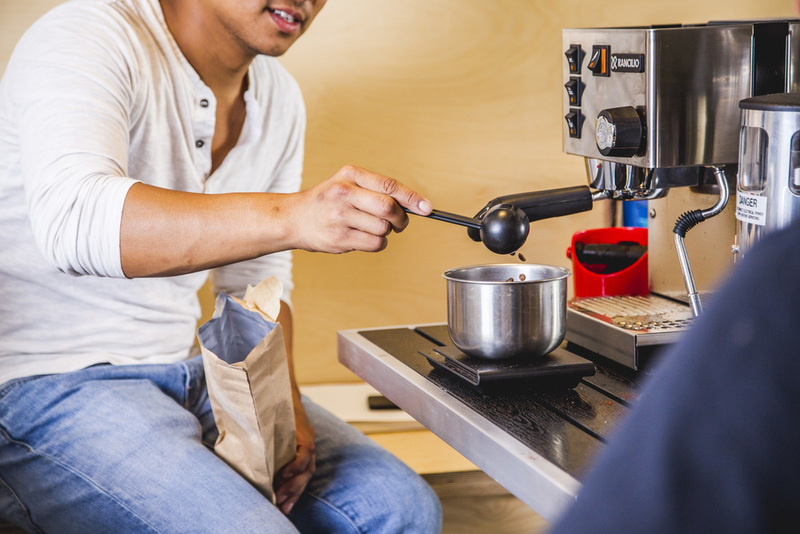 Tapping into their mutual passion for working with their hands to craft and forge the known from the unknown, they found craft coffee could satisfy this artisan desire while providing them with a livelihood they could both enjoy. Rock climbing. Matt Delarosa (left) and Raul Macias (right). Photo provided by Blacksmith Coffee Roasters. "We just like working with our hands. That's why it resonated with us" said Macias when talking about choosing Blacksmith Coffee Roasters and an anvil for their branding. "Everything we work on...our cars, our bikes. Metal, wood, steel. We love to work on with our hands...even if we don't know how to work on it, we'll figure out how to do it. And it's the same when it comes to coffee [roasting]" said Delarosa. While this may be the first time you're hearing about Blacksmith Coffee Roasters, Macias and Delarosa, have been passionately researching and pursuing their dream since they found themselves sitting in coffee shops years ago talking about coffee and gravitating towards specialty coffee and roasting. Doing market research in San Francisco. Matt Delarosa (left) and Raul Macias (right). Photo provided by BCR. It's all beginning to take shape now. They have a location just a couple blocks south of Moonlight Beach in Encinitas right off North Coast Highway 101. They're just waiting on building permits from the city to begin the build out. Blacksmith Coffee Roasters is shooting for a late Summer or early Fall Grand Opening. Roasting on a 5K U.S. Roaster Corps gas roaster, will give them the control over the roasting process that many small batch artisan coffee roasters enjoy. They will source their beans through Bodhi Leaf, a green coffee trader out of Orange County to start, but have expressed an interest in more direct trade with origin. Their menu will consist of traditional espresso offerings, single origins and a full range of teas. When it comes to their roasting process, Delarosa credits Daniel Charlson of Dark Horse Coffee in Normal Hieghts "[He] continues to inspire us and has been a huge help, and literally one of our first supporters. He constantly and consistently believed in us." In addition, Delarosa added, "Aaron from Handlebar Coffee Roasters in Santa Barbara has also been a huge supporter and was one of our first supporters, super thankful for both of them. Both have blown us away not just with their coffees, but with their passion, personalities and their drive." Black Smith Coffee Roasters believes in supporting other local businesses, and they're working with a local bakery to not just provide fresh baked pastry, but pastry, both sweet and savory, that pairs well with the coffees they're roasting. They will also offer gluten free and vegan options. Roasting coffee well is their number one passion, but they know that space and atmosphere matter. They designed a space that will be modular with mobile fixtures to make room for community events, music and latte art competitions like the Thursday Night Throwdown's the San Diego Coffee Network organizes. "We want to be able to open it up, flip down tables and completely support art events...skate events [with the lot right next door]...be part of the community," said Macias and Delarosa. It is important to both Macias and Delarosa that the space be warm and welcoming to everyone, as well as an outlet for creativity just like so many coffee shops they've visited have been for them over the years. Blacksmith Coffee Roasters will make their SDCN debut on the brew bar pouring tasting flights of their coffee at the Thursday Night Throwdown hosted by Lofty Coffee Co. on August 21. Also on the brew bar will be Bird Rock Coffee Roasters (2012 Micro-Roaster of the year). Macias and Delarosa are fans of both and looking forward to being a part of the craft coffee community in San Diego. To subscribe to Blacksmith Coffee Roaster's email list and receive a coupon for their grand opening, please go to their website blacksmithcoffeeroasters.com. You can also follow them on instagram here. If you're opening a new roastery, cafe or brew bar in San Diego, we'd like to hear from you. Please write us at info@sdcoffeenetwork.com.